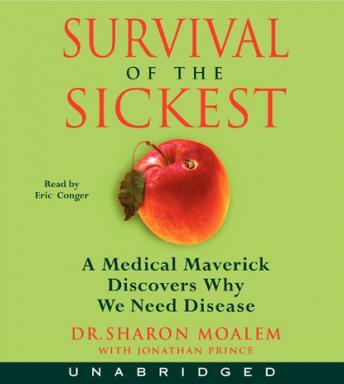 Listen to "Survival of the Sickest: A Medical Maverick Discovers Why We Need Disease" on your iOS and Android device. How did a deadly genetic disease help our ancestors survive the bubonic plagues of Europe? Was diabetes evolution's response to the last Ice Age? Will a visit to the tanning salon help bring down your cholesterol? Why do we age? Why are some people immune to HIV? Can your genes be turned on—or off? Survival of the Sickest reveals the answers to these and many other questions as it unravels the amazing connections between evolution, disease, and human health today. Survival of the Sickest is filled with fascinating insights and cutting-edge research, presented in a way that is both accessible and utterly absorbing. This is a book about the interconnectedness of all life on earth—and, especially, what that means for us. Read it. You're already living it. Well written and e narration was Alfie, but stiff. It sounded like he was reading the whole time. Lots of over enunciation. But still, the book was interesting. I feel like I got some interesting new perspective, which I was looking for.